Hello! Welcome to Poppyprint and my entry to the Bloggers' Quilt Festival. I am so happy to share this quilt with you. It's been over a year in the making, with cutting freezer paper templates, piecing scrappy letters on retreats and finally straight-line quilting slowly, slowly over the past couple of weeks. Binding went on in the last 2 days, so this one is a fresh finish! 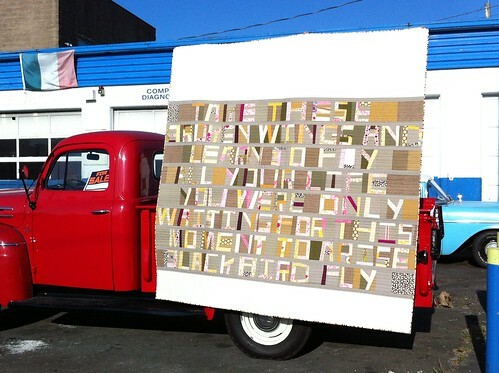 Word quilts are usually very evocative and they always impress me. We can express so much with words in cloth. Blackbird has been one of my favourite songs for over 30 years - I originally learned the song in a youth choir and my love for it was cemented during a 9th grade Beatles obsession. The simple melody and meaningful lyrics get me all misty, no matter if it's sung by the Beatles, Sarah McLachlan, or Chris Colfer of Glee (all three versions are on my iPod playlist). I wasn't keen on improv piecing so many letters, so I turned to Denyse Schmidt's Proverb quilt templates for this project. 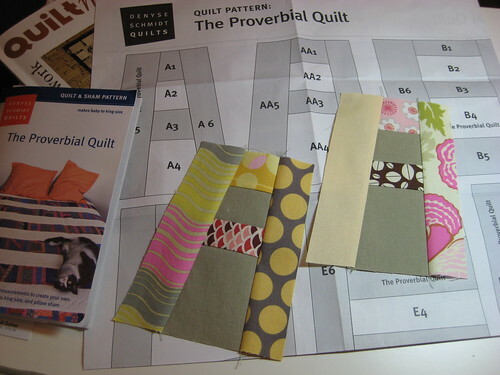 Originally I chose a grouping of fabrics intended for a dresden plate quilt. Then I realized I might be pushing my luck with so much pink AND Dresden plates on a quilt for our bedroom. I'm sure my husband B has a breaking point, no matter how badly he'd like a quilt on our bed (if for no other reason than something to show for this obsession of mine. Like most quilters, I do give away almost everything I make). Once I'd switched gears from plates to lyrics, I chose Essex linen in putty as the main background, supplemented by a linen-look French General cotton from Moda. More yellows, greens and *gasp* even browns were added to offset all the pink and yellow. I wanted the letters and background to blend a little - so that the words wouldn't jump out, but rather require a bit of effort to read. The top and bottom framing strips are Kona bone. Instead of cutting plastic templates for each letter as the pattern suggests, I used a freezer paper method which eliminates the need to trace onto fabric (I will share a tutorial soon). Either way you cut it, piecing all of those letters takes heaps of time. It was a slow and mindful project that I thoroughly enjoyed, especially because it was all pieced on my Singer Featherweight. Some things are just worth the time. Over the course of the year, I pondered different quilting ideas. I considered spacing the lines of lyrics with sashing, as in the original pattern, and handquilting in the musical notes of the song with perle cotton. I also thought about writing out the entire lyric with free motion quilted script in the sashing. In the end, you can see that I decided to piece the words close together, as they are intended, instead of separating them with 6" sashing. The words are so beautiful together, I figured keeping the quilting simple was the best bet, so I went with straight lines about 1" to 1.5" apart. I used the sashing seams as a guide, as well as strips of 3/4" painters tape across the quilt but the lines are still quite organic and definitely not precise. The back was the perfect place to have bit of fun in a filler strip between hunks of yardage. Thanks for visiting. I hope you enjoyed seeing "Blackbird Fly" and I encourage you to visit the other blogs participating in the Blogger's Quilt Festival and nominate your favourite quilts. Amy has lots of fun categories for you to keep in mind as you peruse the beautiful quilts! I love the blackbird song! What a beautiful quilt you made! So much work to piece all those letters! To say I love this quilt is an understatement, it is absolutely gorgeous Krista!! I love that you chose to let the words blend into the background, love the way you quilted this, love the lyrics, love the song. This is amazing, you should be very very proud!! Wow... incredible! This one is definitely worth the time. Oh my goodness Krista. That is one beautiful quilt. And SUCH a fantastic idea! Fabulous Krista! The colour palette is beautiful in this quilt! Fabulous, Krista..I love the colours. Absolutely gorgeous! I've been wanting to make one of these forever. Yours is stunning. Congratulations on the big finish Krista! It looks lovely all quilted and bound. These are some of my favorite colors but it would never slip by my husband so you are a very lucky duck! Gorgeous quilt. Beautiful. Just my kind of colours and very clever to blend the letters into the background so it's not overwhelming. I hope you get to keep this one! This is a stunning quilt! Every detail is excellent and I especially love how the quilting works so nicely. I too love this song, this is a very special quilt. What a special quilt! I love writing on quilts, and I love your color choices. WOW!! What an incredible quilt!! Love the colours and the verse...very special, indeed!! You outdid yourself...AGAIN!! Krista your quilt ia so amazing and beautiful. It is a very special quilt. I am sure B loves it as much as we all do. Wow, this is gorgeous! I love the fabrics you chose, and the overall effect is stunning! Krista this is beautiful! I absolutely love it, and honestly, I didn't even notice the pink till you pointed it out. Which is saying a lot :) Beautiful beautiful. just so amazing! Good things take time and this was so worth all your time and effort, Krista. While the pictures are great, it was incredible to see it in person last night! What a lovely quilt Krista! Apart from the lyrics I also really like the colours you have chosen. Beautiful! It's wonderful!!!!! You are just way too fun and creative. I am so excited to see this quilt complete!!! It's so gorgeous! You did an amazing job. wow! that is beautiful. Such a lot of work and totally worth it! I'm floored by the beauty that is your quilt. Expertly planned and executed--not that I expected anything less from you. I just love how this came out. The colors are perfect. What a fun, unique quilt! Krista, it is fantastic. Love it! SO cool Krista. Love it! Krista it is SO beautiful!! I can't wait to see it in real life!! You did an amazing job. This is seriously one of my all time favs!!! Everything about your quilt is fantastic. I love it. What an accomplishment for you! Congrats on such a lovely finish. 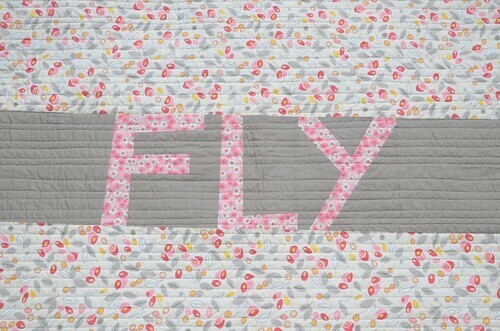 The straight line quilting is a perfect choice with those letters. Can't believe the patience this one took! Oh my goodness, this is so amazing. You should be so proud - everything sings, the lyrics (duh, obviously) the colours and the carefully considered placement. It has all come together so well! I'm such a fan of the organic straight line quilting too, particularly when your piecing should really take centre stage, as it should here. What a joy to see this on your bed every day! Yay! You stop it right now! Are you kidding me? This is a masterpiece. I am in awe! I don't think I've seen this before Krista! It's a fabulous entry into the festival. Now I will be singing Blackbird for the rest of the day! This quilt is so gorgeous, Krista! I love the background fabrics you chose as well. Just love it. So much. 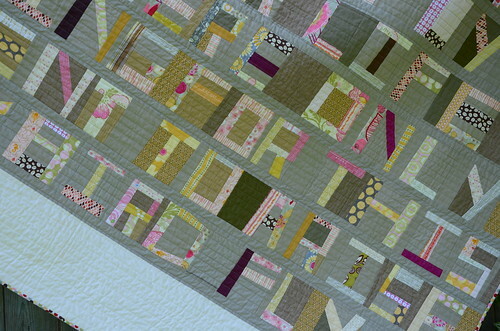 Love the subtlety of the words in your quilt. I've always loved words and phrases but have never considered how I could incorporate them into a quilt as well as you've done. Well done! Truly a masterpiece of "slow quilting." The time and care and love that were put into this quilt really do shine through. Every last detail is perfect. Well done, you! This is a very provocative and original quilt! I love the way you used the colours to have the words fade into the background. I am trying to see if you took the straight line quilting through the letters but I can't tell. Lovely. Wow!!!! This quilt is amazing!! I love it!!! 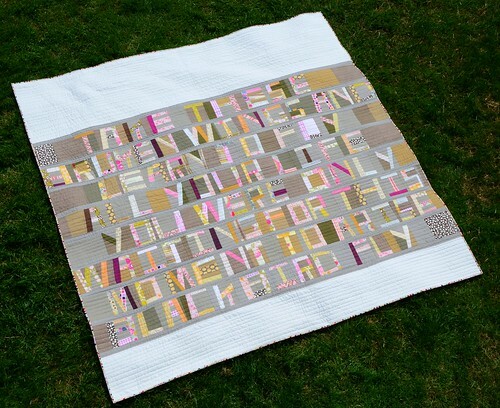 The colours, the words, the quilting....all perfection!!! This is a truly beautiful quilt, - lovely colours, and the quilting is just right! I love that song too... There's something so enigmatic about it. Your quilt evokes that same feeling. It is beautiful Krista (with just the right amount of pink for a man too)!!! That was very creative. Thank you for the comment on my quilt as well. That is so so nice of you. I love the fabric that was used btw. The pink floral with the gray is so stunning. A gratifying labor of love, this gorgeous quilt! Outstanding job. I feel like I'm trying to study it from here, so much to take in. I want to get closer for an in depth look at your treasure. Really wonderful work, I'm so impressed. Congrats Krista! Stunning. I sang that song as a lullabye to all of my babies, so I especially love it! What a wonderful quilt. You must have worked so hard to get it done. Love the colors. Thanks for sharing. Utterly gorgeous!! I was listening to that song when I was giving birth to my daughter, although she was born to Lucy in the sky with diamonds!! It's really beautiful! This quilt is absolutely gorgeous!! I love the Blackbird song too, my favourite memory of it was seeing Crosby Stills and Nash sing it in concert. Having watched this come to life over the course of retreats and QBTBs it is wonderful to see it complete, your vision realized and so very lovely! The setting of the words is perfect, readable but not obvious and you did a great job of balancing the pink so B won't feel like he is under a too feminine quilt. It is going to be a fave in our show for sure! Stunning, Krista! You continue to inspire. I love how the letters blend with the background. Now I have Blackbird running through my head! Have a great long weekend. this is a stunningly beautiful quilt! Love the song and the design. Wow!! Beautiful quilt. It's gorgeous Krista. Thanks for sharing at last guild meeting. Absolutely stunning! I'm sure I'll come back to look at your built again and again. Love your colour choices. Gorgeous altogether! Gorgeous gorgeous gorgeous! Love your colour palette - beautiful fabrics that look amazing with Essex putty. Wow. Truly artistic! Such a great idea to use letters that way. It makes me rethink the use of Denyse's pattern. It have artistic element... beautiful! Oh. my. word. I think this is my favorite quilt in the festival. The colors are so perfect - and I dearly love that song too, how amazing to see it in a quilt. LOVE how you quilted it. And pieced on your featherweight too. This is stunning! It's beautiful! So cool! I've never seen a word quilt in this magnitude before and it's stunning. Love your text quilt. I admire your patience to make all the letters using the template method. Your quilting is just right for the quilt. i love this quilt so much Krista. SOOOO MUCH!!!!! i love the colours (which frankly, is odd, cause they aren't me at all), i love the denyse schmidt letters and the blocks of fabric you added between them, i love the space you added on the top and bottom, i love how you quilted it, and like you, it's one of my favourite songs, so i love the words too! Seriously this quilt is amazing. The colors, the song you chose...love it all! Wow, it's beautiful. I love the colour combination and I'm impressed by all the piecing. Wow, Krista, this is gorgeous! Wow! This is one of my very favorite quilts! I'm definitely nominating this one. I have always wanted to make the Proverbial Quilt--using some lines from The Prayer. Tutorial please--that would be great. And like you, I think I'll take my time and piece all the letters on my Featherweight. This is absolutely stunning, Krista! Beautiful quilt for a beautiful song! Love the simplicity of it.I really want to make a word quilt like this. I'd love a tutorial. Thanks! Very obviously a lot of work - so beautiful Krista. Thanks for adding this to the world! Wow - I love this! I'm not sure how I missed it during the festival. So impressive and so cool! I LOVE this quilt. I've done a pillow using this quilting alphabet, but I really want to do a quilt with this alphabet. I'd love to know how you did the freezer paper method for the letters. Please do a tutorial soon! I can't wait to see it. I LOVE your quilt. I made a pillow using this quilt alphabet, but I really want to make a quilt using these letters. I'd love to know your freezer paper method of doing the letters. Please do a tutorial soon so I can figure it out. Tracing the templates is so time consuming.